Refill packs dispense liners one at a time — no perforations or unraveling — and are designed to fit perfectly inside bins with our built-in 'liner pocket' system. Clear blue tint — meets many municipal recycling guidelines. No complaints about the bags. Fits the bin perfectly. Would be really great if the bags had a bit of stretch like some other brands. 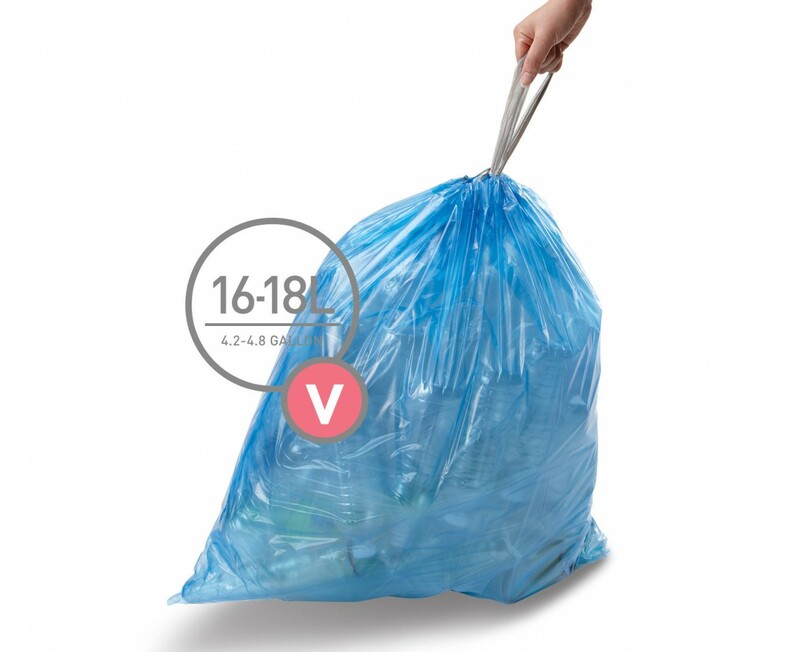 The only bin bag that fits the bin but this product is so difficult to find in a store. Would like it to be more widely available. Good quality and good value. Good but I need compostable bags for food waste. Good but I need compostable bags for food waste. My local authority refuse collection does not accept non-compostable food waste bags. Thank you for taking the time to review your liners. We are always looking for ways to improve our products and serve you better. We appreciate your feedback. The orders come quickly and so far always correct. The bags fit perfect. I like that there are many size choices. First purchase:recycle bags, have not used enough to review. I really like the can. It was a gift! Never thought the day would come when I would rave about a bin liner! But Simple Human liners just do the job perfectly. They fit the bin, they are safe and strong, and new ones easily accessed from their packs. Perfect! Love the fit and durability of these bags! I have the combo bin with the V for recycles which I use. Only thing keeping me from buying the trash can liners is I like the bags with the "febreze" scent. But overall they are great liners! Love how customized the bags are to fit the trash can. They are durable and the bag is recyclable also. My only suggestion would be to have a "febreze" type scent ( at least on the trash bags). Taille et forme parfaitement adaptées au bac de la poubelle, ils sont très solides et faciles à fermer avec les liens coulissants (très solides, eux aussi). Le prix un élevé est justifié par la qualité et l'adéquation parfaite à la poubelle. The custom fit liners are the best. No mess, strong and they slide in and out effortlessly. When buying liners in bulk they are a good deal. The colour coding is especially welcome in keeping the trash stream separate with small children in the house. The kids easily recognize what goes where. These are great, fit beautifully, no splitting, love the 3 pack refills, won't buy any other brand now. Buy them with the H size for the combi bin. Good on delivery too! These are perfect - they fit the bins well and excellent quality. You won't be disappointed. We have dual cans for both of our homes and they fully meet expectations. Might be night to make the dual canisters of equal size, however. I have the combination recycling/trash can and I just love it! Our city has us separate recycling and trash and this system makes it so easy. The bags, both the H and the V, fit the can well and are very sturdy. Haven't had an "accident" yet! Great product!! These bags are sturdy and fit tightly around the can. No messes ever! Easy to order,fit perfectly and great quality! No fuss, no mess; they just do the job perfectly. Love the recycler bin too! Like how the bags fit so well and there isn't a fight to get them in and no need to conceal excess because there isn't any. I do use the recycle bin (smaller) for garbage so I am not sure the difference with the blue bag vs. the white. I guess I should read to see if it explains. Love the dual compartments. We seem to have more recycle than garbage. Not sure if that is good or bad. These fit perfect in our can. Easy to use and dispose of. These bags are made for the size of the containers. They are right at our fingertips, and we never have to look around for recycle bags. While these are meant as recycle liners don't let it fool you into thinking they aren't as strong as the normal simplehuman fitted trash liners. In my house we actually use these as normal trash liners since we produce less trash than recyclables and have the bin usage on our wide-step rectangular recycler switched. No complaints here! Why did I give it 5 stars? What more could you possible ask of a trash bag besides to hold your refuse and not leak water or rip. These definitely take what you give them.